The O'Connell Bridge was originally the Carlisle Bridge, constructed in 1791. 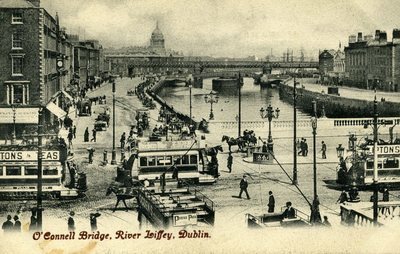 It was modernized in the late nineteenth century and reopened as O'Connell Bridge in 1882, in honor of Daniel O'Connell (1775-1847). O'Connell "is remembered in Ireland as the founder of a non-violent form of Irish nationalism, and for the channelling of Irish politics by the mobilisation of the Catholic community as a political force, with the help of the clergy." As he set foot on O'Connell bridge a puffball of smoke plumed up from the parapet. Brewery barge with export stout. England. Sea air sours it, I heard. Be interesting some day get a pass through Hancock to see the brewery. Regular world in itself. Vats of porter, wonderful. Rats get in too. Drink themselves bloated as big as a collie floating. Dead drunk on the porter. Drink till they puke again like christians. Imagine drinking that! Rats: vats. Well of course if we knew all the things. Looking down he saw flapping strongly, wheeling between the gaunt quay walls, gulls. . . . This unsent postcard is from Lawrence Publisher, Dublin. Do you have any further information about the scene portrayed in this postcard -- including details of clothing, etc.? Put it in the comments, please! Anyone may feel free to use cards from my turn-of-the-century postcard collection as long as they remember to credit me (Gail Hapke) and Scribal Terror as the source. I got nothin' on history - those trolleys are magnificent. Looks rather like a model for the (US) Capitol building in the background as well.